Finely chop the onions, slice the carrots and crush the garlic, put them into a really large casserole-type pan (roughly 26cm in diameter and 12cm deep), with a splash of olive oil and a good pinch of salt and pepper. Place on the stove and cook over a medium to high heat, stirring as you go, until everything starts to caramelize. Add the marmalade, tomato sauce, Worcestershire sauce and beer. Give it all a good stir, then leave to gently simmer. Now it’s time to brown the shanks. Season with sea salt and black pepper. Place a large frying pan on a medium to high heat with a drizzle of olive oil. You can cook them in batches if needed. Turn them every few minutes. Once the shanks are beautiful and brown, pour boiling water over the rosemary to release the flavours, then pick the leaves and chuck them into the pan to get crispy, but don’t let them burn. Use tongs to move the shanks into the casserole dish, then pour in all their juices and the crispy rosemary from the frying pan. Add the stock. Cover with tinfoil, put the lid on and place in the oven for 2 hours. Take the tinfoil and lid off and let the shanks caramelize, cook for another 1.5 hours. Boil the kettle and cook the potatoes for 25 minutes. Drain, let them cool them peel off the skin. Place into a pot, add the butter and milk and mash until smooth. Add the garlic powder and salt. Keep warm. When the lamb shanks are ready, carefully move them to a platter, making sure the meat stays intact. Cover with tinfoil to keep warm. Place the casserole dish on high heat and use a stick blender to blend the sauce a little bit. Then allow to reduce down and thicken. This will take about 10-15 minutes. Add a little splash of apple cider vinegar and a few more splashes of Worcestershire sauce to the sauce. To serve, place the mash onto a large serving platter, put the shanks on top of the mash and ladle the sauce all over the lamb, pour the rest into a jug for people to help themselves. Serve with mint sauce. 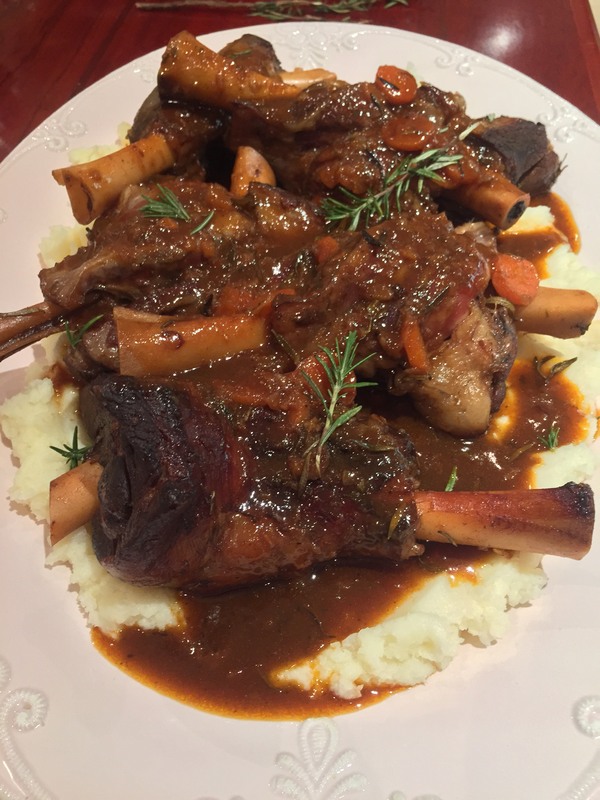 This entry was posted in Meat dishes, Recipes and tagged ale, carrots, garlic, garlic mashed potatoes, Kilkenny, lamb shanks, marmalade, rosemary, slow roasting, summer. Bookmark the permalink. Oh, great! That makes perfect sense Natalie 🙂 Thanks for the great advice and such a delicious recipe!